It’s still summer in England, even though the first patches of bright gold and pale russet are beginning to appear in the hedges. It’s a great year for plums, too. And I’m really looking forward to the sloe harvest this year. I’ve even found cobnuts amongst the local hedgerows, so there’s a busy autumn of picking and cooking ahead of me. Still, at the moment it’s still summer and time to enjoy the weather. We spent last weekend at Bosworth, for the 526th anniversary of a battle that ended the very long and bloody Wars of the Roses. Even after all this time, the events of that August day in 1485 catch the imagination of re-enactors and spectators alike – and the organisers put on a very fine show, with archery displays, jousting, falconry, one of the largest living history displays I’ve seen in a while and – of course – a magnificent re-enactment of the famous battle. Come to think of it, I always wanted a sword! Historical accounts are usually written by the winner, and nowhere is this more apparent than in the case of the much maligned King Richard III. After he lost his life at the Battle of Bosworth on August 22nd, 1485, the Tudor publicity machine sprang into action. Suddenly Richard, an able, fair administrator and skilled battle commander, was turned into a vicious, hunchbacked murderer, someone who fully deserved his violent fate. But on that August morning, the outcome of the battle had been far from clearcut. For a long time, Richard's forces had the upper hand. Even when Thomas, Lord Stanley, deserted the king and Sir William Stanley's forces attack the king's troops, Richard refused to give in. 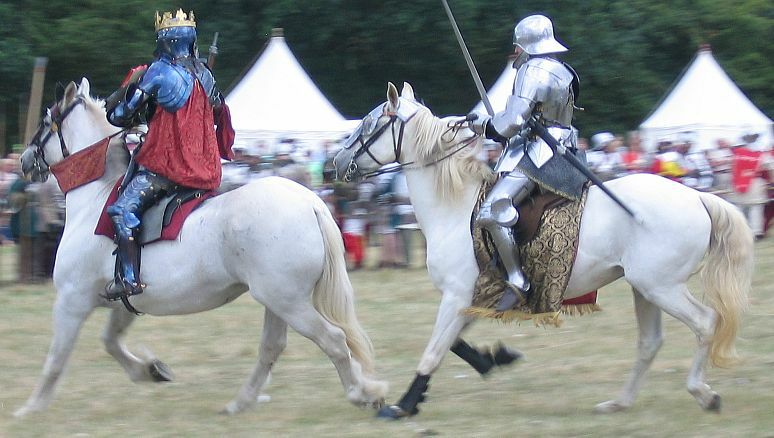 Courageous to the last, he launched a charge at Henry Tudor and his guard and came within striking distance of his challenger before he was cut down. Whatever sins Richard may have committed in his life, he was not as bad as Tudor propaganda painted him. And his claim to the English throne was far better than Henry's - which had a lot to do with the vitriol spewing from the Tudor camp for years thereafter. Richard's death ended the 330-year reign of the Plantagenets and began a new dynasty, the Tudors. It ended the long civil war between the Houses of York and Lancaster and brought England prosperity. Still... what if Richard had won that day? I’m often asked which books it might be most useful to read before coming to England. So assuming that since you’re asking me you like history, food and a bit of old-world charm and quirkiness, I thought I’d put together a little reading list of my personal favourites. We usually start our own travel planning with a Lonely Planet guide. They’re well researched and regularly updated, are full of useful information and make a great starting point when researching a new holiday destination. Strangely enough, I don’t own a Lonely Planet England guide, but we have enough of them on the bookshelves for me to be comfortable recommending them. If you’ve never been to England, then The Most Amazing Places to Visit in Britain is just the book to whet your appetite. Intriguing stories, a mix of well-known and unexpected places, and wonderful photographs – what more could you need to get in the mood? Ben le Vay's Eccentric Britain is a book that explores the more obscure aspects of life on our enchanted isles. If you like to have a little chuckle about strange customs, or find out why we celebrate certain events - here's a great book to get started. Just as long as you don't take it too seriously! No doubt due to the Bosworth trip and my preoccupation with Richard III, my mind is firmly stuck in medieval times at the moment. So I thought a tasty medieval sweet might fit the bill this month. It's a fancy way with sliced bread, really, and very easy to do if you have to cater for your kids' medieval faire at school. I found the original recipe in Medieval Cookery, a nifty little book produced by English Heritage. But as usual, I cannot help fiddling a little. The original calls for pine nuts, but I've also made it with very slightly salted, toasted almonds and walnuts (my personal favourite). You can also try different flavours of honey and see what you like best. Lightly toast the bread and cut each slice into quarters or long strips. Warm the honey with the spices until runny. Don't let it boil! I can guarantee you that this is impossible to eat with your fingers, so make sure you have a fork to hand. And plenty of warm water to wash or at least a damp cloth. Your fingers will get sticky no matter what implements you eat with! Well, we've been out and about a bit during August and explored Roman walls and bath houses, medieval wall paintings and the hiding places of King Charles II on his flight to France. Fun stuff all that - now I just need to find time to write it all up!